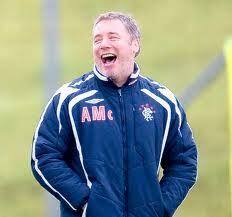 ← Have Rangers* Spent Over £32 Million Since June 2012? Ally McCoist – Moving to the Edinburgh Festival? The Thursday night meeting I wrote about earlier also seems to have included a candidate for “one liner of the year”. Move over Michael McIntyre! – Here’s Ally! 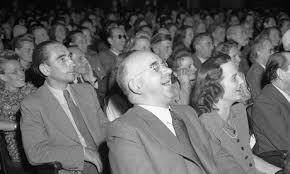 The crowd appreciated Mr McCoist’s one-liner! Is it unkind to point out that the wage bill of a couple of years ago related to a team packed full of internationalists, to a team playing in, and winning, the SPL, to a team competing in European competition and indeed reaching the UEFA Cup final? Is it churlish to suggest that there is nothing to be admired in the wage bill being reduced by 2/3 when almost every one of the high earning players left, and being replaced by players who will still rank amongst the highest paid in Scotland? In what way is it deserving of sympathy that Rangers are, this season, competing in the third tier of Scottish football but still having the second highest wage bill in the country? On a rough calculation Mr McCoist’s statement means that the wage bill at Ibrox is in excess of £6 million (and possibly more!) On that basis I am fairly sure that the Rangers wage bill exceeds the combined wages of every other player in the third and fourth tiers added together! Indeed almost certainly their wage bill, to produce a team capable of beating holding Forfar for almost 120 minutes, exceeds every team in the top 12 apart from Celtic. And so, as I said, Mr McCoist, if he dashed through to the Gilded Balloon, would have a chance of winning whatever the Perrier Award is called these days! After a lovely pub lunch with the divine Mo,i see that my “secret affair” with Marge is rekindled,,,Marge doll,go back to ignoring me,,,like i told wee Mo when ours eyes first met across a smoky ludge ,,the names Cam doll,remember it,,you’ll be screaming it later! Monti has been ridden to exhaustion,Creggy is biting the pillow and Ted’s arse is in tatters,,,,what a day ,what a day. Ted,what do you think of these wasters?,,Marky Daly could have an entire award winning series if he got tore into this nest of vipers. AHHH, Glasgow Cooncil Cam. A hot bed of efficiancy and integrity. wretches of the city, still vote for them, zombie like. Time after time after time. Yet another mystery of Scottish unionists. A lot of truth in what you say Geddy. Also a lot of truth in the fact that many Celtic fans would never contemplate an independent Scotland, as they perceive it to be a hotbed of anti-Irish racism ( as instructed by Phil MacMadeupname ) and Masonic plots. I tire of trying to convince people of the benefits of Independence and of leaving all this bigotry shite behind. Glasgow- 23 R.C. Lord Provosts and 1 Jewish person in a row. Do I care. No. Simple adherence to a corrupt, venal and grossly incompetent Council, dominated by the Labour Party which in itself is dominated by Catholics in the City. That is not a problem. Towrags like Purcell are, and we even have one now who …..
ach, I wont go there. Unbelievable he didnt resign. They even had one- Mosson ( a familiar face around Parkhead ) that robbed pensioners. @David…I don’t see your reasoning at all David. The majority of Celtic fans I know want away from the royal crown for many varying reasons. From being an unelected parasitical family to simply disliking them for their stance towards Catholicism. McMurders site advocates a united Britain for the opposite reasons that I’ve quoted above. Rule Britannia etc. So basically I would say your reasoning is flawed if that’s the generalistic view you arrive at. This investment has actually been used for day to day running costs apart from £3.5m (its all in the Sun from Stockbridges mouth). Today BS states they have £10m left, from £41M in 13 months.